This vintage Steinway & Sons Model C Grand Piano has been fully rebuilt and features an African Flame Mahogany finish. 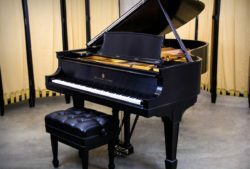 This 7'5" semi-concert grand piano features a warm, robust bass and a wide overall range of tone. This instrument features a gorgeous African Flame Mahogany cabinet, a fully rebuilt action and much more. This piano has been sold to a regional university. This unique and powerful Steinway Model D Concert Grand Piano has undergone a full premium rebuilding process. Featuring a unique, Western Red Cedar Soundboard this instrument was originally built during Steinway & Sons' "golden era" of high-quality craftsmanship. This concert-level piano features an incredible sound and a fully regulated, responsive action. This one of a kind instrument is for sale at the low price of only $68,900. This concert grand piano was sold to an arts center in Hastings, Minnesota. Contact us today if you are interested in purchasing one of our fully rebuilt Model D Grand Pianos. Error: Error validating access token: Session has expired on Thursday, 10-Jan-19 19:00:02 PST. The current time is Wednesday, 24-Apr-19 21:16:07 PDT.